Members of the public got one last say Monday night in the future plans for the Leesburg Town Hall campus. Deputy Town Manager Keith Markel led the final public input for the master plan for the Town Hall campus plan, drawing about a dozen members of the public to tour the Town Hall grounds and offer their final input on what features or enhancements could be added to the grounds. The idea to develop a master plan for the Town Hall property stemmed from Board of Architectural Review discussion last year. At the time, the BAR was considering the splash pad project at Mervin Jackson Park, next to the Town Hall parking garage. Voicing concerns about how the project fit in within the historic downtown, and on the property as a whole, board members urged the Town Council to focus on developing a plan for the entire property rather than focusing on projects on a piecemeal basis. The process of putting together a draft plan to ultimately present to the Town Council, expected to occur this fall, has thus far involved input from town boards and commissions and stakeholder groups, including the Historic Downtown Leesburg Association and the Loudoun Museum; and a Leesburg Listens online survey that garnered public input. 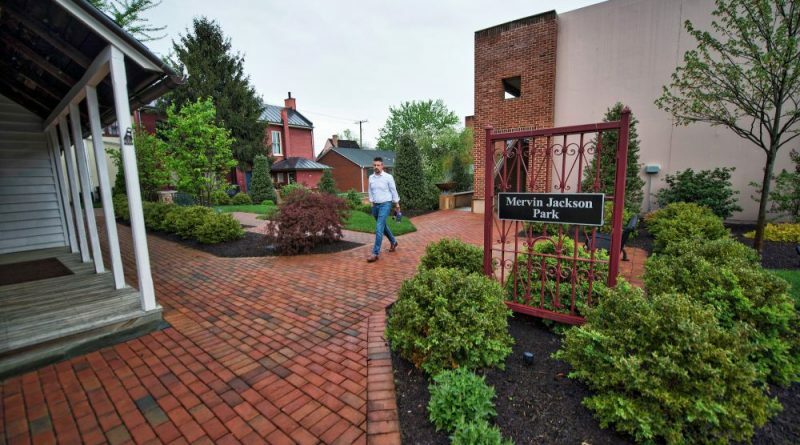 Town staff has asked these groups to evaluate the nine planning areas on the campus property, including the Loudoun Museum and Rose Garden property, the Town Green, the facades of the Town Hall parking garage, and Mervin Jackson Park. With each area they have provided suggestions on possible additions or enhancements, but mostly have left it open ended for the public to share their own ideas. Monday night, those who participated in the final public input session included a heavy presence from the public arts community, the Historic Downtown Leesburg Association, and Loudoun Museum. One idea that received unanimous support was the addition of a tenth planning area to the Town Hall grounds: the alleyway alongside the Town Hall garage. “Especially if we’re doing a long-term plan and if we leave out the alley we’re leaving out the biggest potential resource we have,” Mary Jo Murphy said. Audience members said the alley could be an ideal spot to host community events, like last weekend’s Arts in the Alley festival. It could even be a site for a weekly farmer’s market, some posited. Markel cautioned that potential development in the alleyway would be limited since some of the property is owned by private property owners. Elsewhere on the Town Hall campus, the ideas that received the most support from those in attendance were those that provided opportunity for greater use of the campus property. Two ideas that received overwhelming support included the establishment of a small amphitheater for performances on the lower Rose Garden property, next to Town Hall; and the placement of wide steps next to the Loudoun Museum’s log cabin to provide seating for concerts in the upper Rose Garden. Interactive displays for children was an idea brought forward several times both by those at the meeting and from responses gleaned via the Leesburg Listens survey. Monday night’s participants suggested that artifacts from the Loudoun Museum that could be displayed outside the building could be an enticement to families to check out the inside of the museum. Placing a 3D map of Leesburg in the Loudoun Museum garden area was another idea. Finally, meeting attendees expressed support for the placement of hanging gardens alongside the Loudoun Street side of the parking garage. What to do with both parking garage entrances was another hot topic Monday night. Markel noted that, as the town moves toward automation, it will mean that the booths on either side of the garage will be coming down, and a decision will need to be made as to whether to retain all the entrance and exit lanes into the garage. Some in the audience suggested closing the Loudoun Street entrance and exit to the garage altogether and adding to the nearby park space. Finally, audience members encouraged the use of more artwork, particularly murals, on the facades of the parking garage to brighten up its appearance.